People often ask me where our agency’s name came from. The name itself – Jacob Tyler – is named after my son, Jacob Tyler Kollegian. But the inspiration for the brand that Jacob Tyler has become, began at a clothing store in Grand Central Station in New York City. In the late 90s, I left a job as the creative director at a large agency to test the waters for new opportunities. While searching for a new job, I started to do some consulting work. To legitimize my new business, I registered the domain name “Vivid Commerce” to host my portfolio, figuring it made sense for a graphic designer that had a strong interactive design and development background– though I hadn’t really given it much thought. Most of my clients at the time – large firms I had connections with from my agency work and referrals from friends – happened to be on the East Coast, mostly in New York City. So I often flew east from San Diego to work with them (in no small part because my “office” in San Diego at the time was my bedroom and my business attire consisted of boxer shorts and tee shirts). From a wardrobe standpoint, I was chronically unprepared for New York. I never packed enough clothes. During many of my trips, I had to extend my stay and the last thing I had time to do was laundry. Knowing I couldn’t go back to the office in the same dirty shirt and tie yet again, I decided to buy some clothes on the way to the office. Wearing the previous day’s outfit, I took the train to Grand Central Station and walked into the Kenneth Cole store… luckily they opened at 8am. I bought a brand new shirt and tie, changed clothes in the fitting room and went off to work. 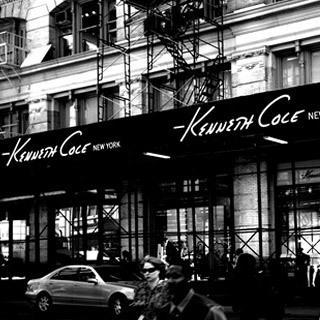 Soon I was in Kenneth Cole up to three times a week, picking up new outfits. I was making decent money at the time, so had some “disposable” income but I kept going back because the clothes were reasonably priced, I thought they looked great on and the customer service was impeccable, always greeting me by name. Eventually, they had multiple outfits, pressed and ready to wear, for me to choose from every morning – whether I showed up or not. By 2003, my “consulting” business was taking off and my son was about to be born. We had decided to name him Jacob Tyler, and I decided to rebrand my company with the same name. Of course I loved the name itself – I had chosen it for my son – but it also reminded me of Kenneth Cole, a brand I wanted the Jacob Tyler brand to emulate. Whenever I left that Kenneth Cole store, I felt and looked great. I wanted Jacob Tyler’s clients to feel the same way. I wanted Jacob Tyler to be the Kenneth Cole of graphic design. Like Kenneth Cole, at Jacob Tyler, we provide a great customer experience and top-quality products at a reasonable price. The inspiration I took from my experience at Kenneth Cole in those early days in New York became the heart and soul of the Jacob Tyler brand. And really, that’s what a brand is – a living, breathing thing. It’s your organization’s culture. It’s the people. It’s what you deliver and how you deliver it. It’s something you live every day. The name Jacob Tyler and our visual representation embody our brand and agency. They communicate who we are and what we’re about. But it’s our culture that defines us. For more than a decade, we’ve cultivated our brand and grown with it, but have never lost sight of those early principles I learned from Kenneth Cole.